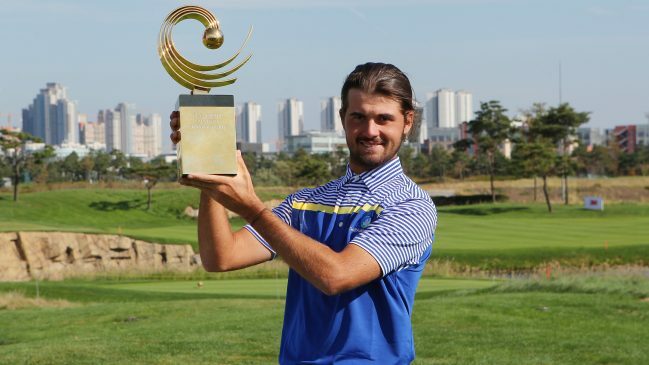 Australia’s Curtis Luck, the world’s second-ranked amateur, overcame a seven-stroke deficit to secure a one-shot victory over compatriot Brett Coletta at the eighth Asia-Pacific Amateur Championship held at Jack Nicklaus Golf Club. Luck, who has already earned berths in the Masters Tournament, U.S. Open and The 146th Open at Royal Birkdale next year after winning the U.S. Amateur in August, carded a bogey-free 67 to finish on 12-under-par (276). As runner-up, Coletta (75) earned a place in The Open Qualifying Series. Following Antonio Murdaca’s victory in Melbourne two years ago, Australian players have now won the Championship twice to equal South Korea (2009, 2013), Japan (2010, 2011) and China (2012, 2015). New Zealand’s Luke Toomey carded a best-of-the-day 66 to finish third at nine under, two ahead of Australia’s Cameron Davis (77), last year’s joint runner-up. Junya Kameshiro (75), Japan’s top-ranked amateur, finished fifth at five under while Chinese Taipei’s Yu Chun-an (69), Thailand’s KK Limbhasut (73), Korea’s Lee Won-jun (73) and China’s Yuan Yechun (70) finished sixth to ninth, respectively. The defending champion, Jin Cheng from China, finished in a tie for 15th at six over par. Luck, 20, was seven behind Coletta at the start of the final day and had to shoot his lowest score of the week to clinch the Championship in his second appearance, having made his debut in 2014. “I’ve had an amazing year and this has topped it off,” said Luck who was part of the Australia team that won the World Amateur Team Championships in Mexico two weeks ago. Playing in the penultimate group, Luck birdied Nos. 2, 11, 12 and 15 and was playing the par-five 18th when he realised Coletta had drawn level with him following a chip-in birdie on 17. Luck had hit his second shot into a bunker, but splashed out to 15 feet and drained a curling putt, following it up with an emotional fist pump. “It was a pretty nerve-racking finish as I knew Brett could make birdie on 18, so fortunately for me he didn’t,” said Luck. Coletta, 20, started the day at 14-under, but a birdie at three was followed by back-to-back bogeys then double bogeys at nine and 11. He bounced back with birdies at 14 and 17 but was unable to convert a birdie putt on the last and force a playoff. “It’s really hard to swallow, but you’ve got to look at the positives. I’ve had three good rounds at a tournament I’ve never played before,” said Coletta, last year’s U.S. Amateur stroke play medallist. “A chip-in on 17 helped and I knew I had to make a birdie at 18, but I had a poor second shot. My chip wasn’t too much better, but that’s golf for you. The ninth Asia-Pacific Amateur Championship will be held at Royal Wellington Golf Club in New Zealand from October 26-29, 2017. The eighth AAC featured 118 players from 38 APGC member associations. Television coverage included three hours of live broadcast on each of the four days and a 30-minute highlights show, and was aired in more than 160 countries, once again making it the world’s most televised amateur golf tournament.